LIKE other persecuted people, the Quakers sought a refuge in America. But even there they were not welcomed. The Puritans of Massachusetts who had fled from persecution, themselves turned persecutors as we have seen. The Quakers discovered that for them there was no Paradise of Peace in the lands beyond the sea. But when George Carteret sold his part of New Jersey Quakers bought it, a young man named William Penn being one of these Quakers. This William Penn was the son of Sir William Penn, an admiral in the British Navy, and a friend of King Charles I. He was a Royalist and a Churchman, and when his handsome young son turned Quaker he was greatly grieved. At first indeed he was so angry that he turned young William out of the house. Later, however, seeing that his son was quite determined to be a Quaker, the Admiral forgave him, and before he died he asked the Duke of York to be kind to him. The Duke of York promised he would. And then there began a strange friendship between the Catholic Prince and the Quaker. After the Quakers bought New Jersey a great many went there. They found not only a large amount of freedom, but a kindly government, for William Penn framed the laws. The Quaker colony of New Jersey was to a certain extent a success, but there were troubles with neighbouring states, and troubles with other claimants of the land. So at length (exactly when we do not know), the idea of founding a real Quaker colony came into Penn's mind. When Admiral Penn died the King owed him £16,000 and William Penn inherited that claim. So he asked the King to pay the debt not in money but in land in America. The extent of the land asked for was exceedingly vague, but it was at least as big as the whole of England. Charles however was always in want of money. So in 1681 he was pleased enough to give away this great tract of land, which after all was his more by imagination than anything else, and get rid of his debt; and acquire also the possibility of getting some gold as well. For in return for his land Penn agreed to pay two beaver skins a year, and a fifth of all the gold or silver which might be mined within his territory. Charles not only gave Penn the land, but named it too. Penn meant to call his new country New Wales, but a Welshman who hated the Quakers objected to the name of his land being given to a Quaker colony, so Penn changed it to Sylvania, meaning Woodland, because of the magnificent forests which were there. But the King added Penn to Sylvania thus calling it Penn's Woodlands. William Penn, however, was afraid that people would think that this was vanity on his part, and that he had called his province after himself; so he tried to have the name changed. He even bribed the King's secretary to do it, but in vain. As some one has said, if he had bribed the King himself he might have succeeded better. As it was he did not succeed, for King Charles was very pleased with the name. "No," laughed the merry monarch, when Penn asked him to change it, "we will keep the name, but you need not flatter yourself that it is called after you. It is so called after your gallant father." So as the King insisted Penn had to submit, and he consoled himself by thinking that as Penn means "hill" the name might be taken to mean Wooded Hills. The tract of land of which Penn now became possessed was smiling and fertile and altogether desirable. It had only one fault, and that was that it had no sea coast. In a new country where there were no roads, and where communication inland was difficult that was a great drawback. So Penn persuaded the Duke of York to give him that part of his province on which the Swedes had settled and which the Dutch had taken from the Swedes, on the west shores of Delaware Bay. Later this formed the State of Delaware, but in the meantime it was governed as a part of Pennsylvania. Everything thus being settled, and the charter being granted, Penn drew up a form of government for his colony, chose his cousin, William Markham, as Governor, and sent him off in the autumn of 1681 with three shiploads of settlers. With Markham, Penn sent a kindly letter to the Swedes of Delaware, telling them that he was now their Governor. "I hope you will not be troubled at the change," he said, "for you are now fixed at the mercy of no Governor who comes to make his fortune. You shall be governed by laws of your own making, and live a free and, if you will, a sober and industrious people. I shall not usurp the right of any, or oppress his person." Penn also sent a letter to the Indians. "There is a great God," he said, "that hath made the world and all things therein, to Whom you, and I, and all people, owe their being. This great God hath written His law in our hearts, by which we are taught and commanded to love and help, and do good to one another. Now this great God hath been pleased to make me concerned in your part of the world, and the King of the country where I live hath given me a great province therein. But I desire to enjoy it with your love and consent, that we may always live together as neighbours, and friends, else what would the great God do to us?" With this letter Penn sent presents to the Indian chiefs and told them that he would soon come to see them himself, and make arrangements about the land. But it was not till the following year that Penn set out for his colony. When he landed the Dutch and Swedes greeted him with joy. And to show that they acknowledged him as their Governor they presented him, as in old feudal times, with a sod of earth, a bowl of water, and a branch of a tree. Penn then passed on to the spot which he had chosen for his capital. And as showing forth the spirit in which his colony was founded, he called his city Philadelphia or the city of brotherly love. It was near this town that Penn met the Indian chiefs and made a treaty with them as he had promised to do. In the Indian language the spot was called the Place of Kings, and had been used as a meeting place by the surrounding tribes for long ages. Here there grew a splendid elm, a hoary giant of the forest which for a hundred years and more had withstood the tempests. Beneath the spreading branches of this tree Penn took his stand. He was young and handsome, and although he wore the simple garb of the Quakers he had not yet perhaps quite forgotten the "modish" ways of his younger days, for about his waist he had knotted a pale blue scarf. Beside him stood his cousin, the deputy governor, and a few more soberly clad Quakers. In front of them, in a great half circle were ranged the Indians, the old men in front, the middle-aged behind, and last of all the young men. They were gorgeous in paint and feathers, and armed with hatchets, bows and arrows, but the Quakers carried no weapons of any kind. Greetings being over, an ancient warrior advanced, and amid deep silence, tied a horn upon his forehead. This was the sign of his greatness, and also a sign that the spot was sacred. Immediately all the braves threw down their weapons, and seated themselves upon the grass. Then the old warrior announced that they were ready to hear the words of the White Chief. Then Penn spoke to the gathered Indians reminding them that the Great Spirit wished all men to live in love and brotherhood, and as the Redman listened his heart went out in love to this White Chief who had friendship in his eyes, and kindliness in his voice. And there under the spreading branches of the great elm tree they swore to live in peace and brotherly love "as long as the rivers shall run, and while the sun, moon and stars endure." These Indians never broke their word and for the next seventy years there was peace in Pennsylvania between the Redman and the White. The Indians gave Penn the name of Onas which is the Algonquin word for Feather. Ever afterwards too they called the Governor of Pennsylvania Onas, and whoever and whatever he was, for them he was great and good. But Penn was not only the great Chief Onas, he was also Father Penn. For he roamed the woods with the Indians, talking with them, and sharing their simple food like one of themselves. This greatly delighted the Indians, and to show their pleasure they would perform some of their wild dances. Then up Penn would spring and dance with the best of them. So he won their hearts. 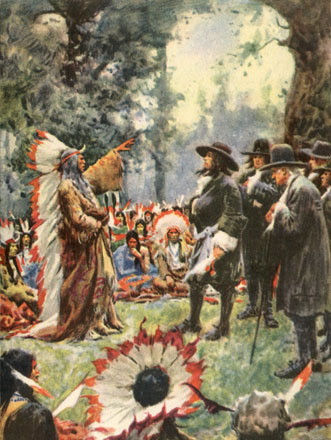 They loved him so much that the highest praise they could give any man was to say "he is like the great Onas," and it was said that any one dressed like a Quaker was far safer among the Indians than one who carried a gun. Life seemed so easy in Pennsylvania that in the first years thousands of colonists came flocking to the new colony. It grew faster than any other colony, so fast indeed that houses could not be built quickly enough. So for a time many of the new settlers had to live in caves dug out of the banks of the Delaware River. It was in one of these caves that the first baby citizen of the city of brotherly love was born. Pennsylvania prospered and grew fast, but there were constant troubles with Lord Baltimore about the border line between his province and Penn's. The British Kings in those days gave land charters in the most reckless fashion and over and over again the boundaries of one province overlapped those of the others. Then of course there was trouble. This had happened with Virginia and Maryland. Now it happened with Maryland and Pennsylvania. The quarrel at length became so bad that Penn went home to England to have the matter settled; after that for a time things were better, but the quarrel was not really settled. It was not settled until many years after both Penn and Lord Baltimore were dead. Then, in 1767, two English astronomers, Charles Mason and Jeremiah Dixon, surveyed and fixed the boundary which ever since has been known as the Mason and Dixon Line. Every mile a small stone was placed with B on one side and P on the other. Along the eastern part, too, every five miles a larger stone was placed with the arms of Penn on one side and those of Baltimore on the other. But further west these were discontinued. For in those days when there were few roads it was difficult to get these heavy stones carried to the proper places. When Penn went back to England he had meant to return to his colony very soon. But fifteen years passed before he was able to do so. During this time King Charles II, who had given him the charter for his great possessions, died, and his brother James, who as Duke of York had been Penn's friend, was driven from the throne. Then for a time Penn's great province was taken from him, because he was suspected of helping his old friend, the dethroned king. The colony was then placed under the control of the Governor of New York. Two years later, however, Penn was cleared from the charge of treason and his right to Pennsylvania was again recognised. Then once more he crossed the seas to visit his possessions in the New World. He found that in fifteen years great changes had been wrought. The two or three thousand inhabitants had now increased to twenty thousand. Many of the new settlers were not Quakers but Protestants from Germany, Holland and Sweden, and Presbyterians from Scotland and Ireland. Penn welcomed them all, but they on their side had grown apart from him. They were no longer his children. He was no longer Father Penn, but the Governor and proprietor. From this Governor the settlers demanded greater liberties than they had. Penn was grieved, but he met the clamour in the most generous spirit. "Friends," he said, "if in the constitution there be anything that jars, alter it." So it was altered until practically the colonists became a self-governing people. Now for a second time Penn felt himself obliged to return to England. He did not want to go, but longed to live out the rest of his life in his colony which, in spite of all troubles and difficulties, he loved dearly. "I cannot think of such a voyage without great reluctance," he said. "For I promised myself that I might stay so long, at least, with you, as to render everybody entirely easy and safe. For my heart is among you, as well as my body, whatever some people may please to think. And no unkindness or disappointment shall ever be able to alter my love to the country." So with just a little soreness in his heart Penn sailed away never to return. At home trouble and misfortune awaited him. And in the midst of his troubles sickness fell upon him. For six years a helpless invalid with failing mind, he lingered on. Then in 1718 he died. He was seventy-four. Only four years of his long life had been spent in America. Yet he left his stamp upon the continent far more than any other man of his time. He was the greatest, most broad-minded of all the colony builders. As he said himself he had sailed against wind and tide all his life. But the buffetings of fortune left him sweet and true to the end.